My sister and my brother-in-law went out to eat the other night at Arturo Joe's - a fabulous restaurant in Narragansett. They both had the Tortellini Carbonara for their meals - my brother-in-law had chicken added to his - and of course the food was sublime. Anyway, I couldn't figure out a way to sneak down to their house and steal the leftovers, so I figured I had to make my own. 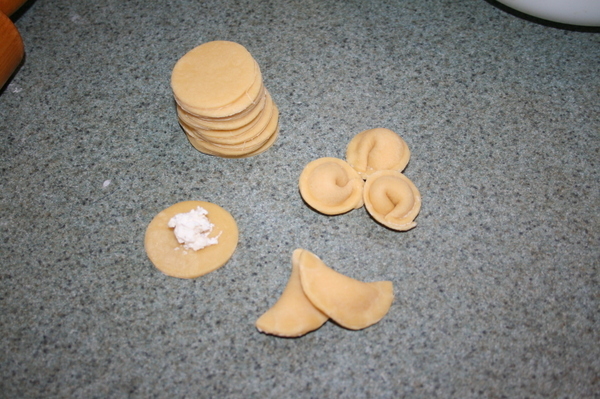 I used to make pasta a long time ago (back before I had anything else to do with my spare time) and I learned to shape tortellini from a book - though I can't remember which book. It may have been a book of my mom's, actually. Anyway. I was in the mood for tortellini, and in the mood to play with some dough, so yesterday that's what I did. The ratio of ingredients I used came from The Splendid Table, by Lynne Rosetto Kasper. 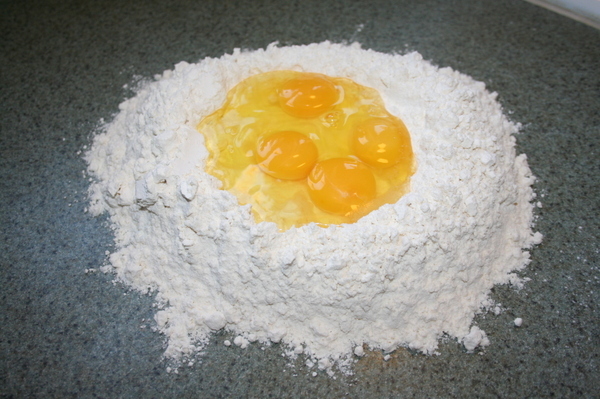 I used the egg pasta recipe on page 80, which calls for 4 jumbo eggs and 3 1/2 cups of all purpose flour. I didn't have jumbo eggs - I had large, so I used 5 of them. and whisk the eggs together with a fork. As you do this, begin to incorporate flour into the eggs, working around the edges of the well, keeping the walls intact so you don't have a flood of egg on your counter. 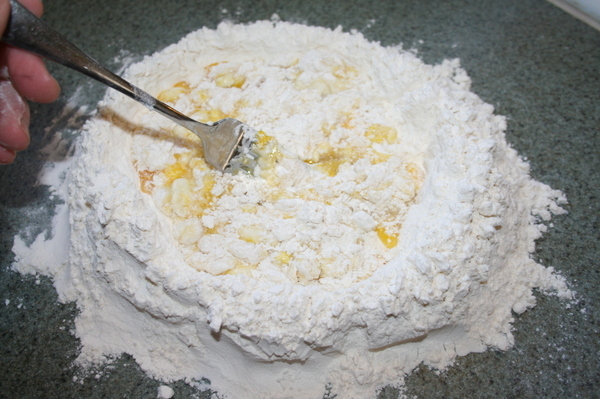 You'll get to a point where using the fork is pointless, so squeeze the dough off that fork, toss it in the sink and dust your hands with flour. And start kneading. It will take a while for the whole rough mass to come together into something actually workable. Initially, it will look a lot like this (and I have too much flour on the work surface, so please ignore my slovenly ways). The dough will seem uncooperative and you'll think you did something wrong. You didn't. It just doesn't look pretty right off the bat. You've got to knead it for a long time. About half an hour by hand. Or, if you are not in the mood to do it all by hand, or you have carpal tunnel or wrist issues, or whatever, you can work the dough in your stand mixer or a food processor. I put this mess in my Kitchen Aid mixer - the 6 quart one, which is more heavy-duty than the smaller one I have - with the dough hook, and let the machine do the work for about ten minutes, until it was a more cohesive ball of dough that I was happier to work by hand. 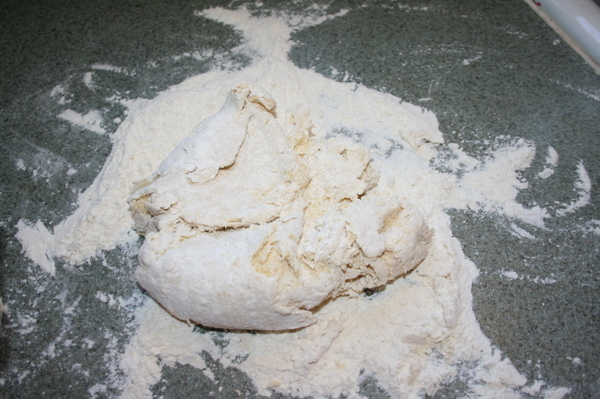 This is what the dough looked like, more or less, when I took it out of the mixer. Looks a lot friendlier, doesn't it? But it's still done. Or, rather, YOU are still not done. It's a nice workable ball, but the gluten hasn't developed, and so if you pull your fingers in opposite directions along the surface of the dough, it will just break. You don't want that - your pasta won't hold together while you're rolling it out, and it won't stretch nicely when you're wrapping it around a filling. So get to kneading. With the fingers of one hand, pull the farthest edge of the dough toward you, folding it over onto the rest of the dough ball, and then with the heel of that same hand, press the dough down and in. Turn the dough a quarter turn and repeat. It takes a while before this feels natural, but eventually you get a rhythm going and it's kind of relaxing. It's also a good way to work out any anger you've got kicking around in your head - the harder your work the dough, the better. I don't know exactly how long I kneaded this dough after I took it out of the mixer, but when the dough has been kneaded the right amount, you will know. 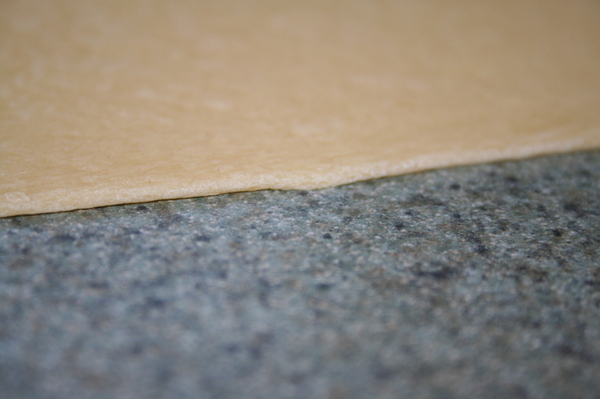 The surface will be smooth and soft, and as you are kneading, you'll notice that when you do that pulling part, stretching the surface of the dough, the surface won't crack any more. The dough will seem to breathe. You can poke it and the indentation will push back when you've taken your finger or knuckle away. 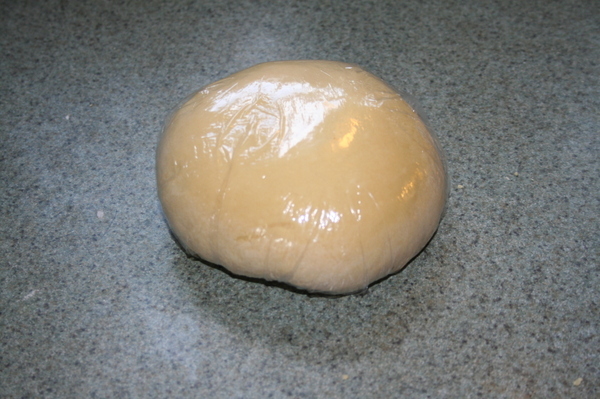 At this point, wrap the dough tightly in plastic wrap and let it rest at room temp. Now's a good time to make a filling. This is how I entertain myself. Anyway - I don't have measurements. And even if I did, it would be way more than you will need. So I will estimate that to fill the tortellini that you are making now, you'll need maybe a cup and a half of the ricotta, about 4 ounces of the mozzarella, and oh, a quarter cup or so (loosely packed, not crammed in like brown sugar) of parmesan cheese, freshly grated (that's a microplane - you get very fine, thin shredded results from it) if possible. Mix all this together and add salt and pepper to taste. You could also add fresh or dried herbs, some nutmeg, red pepper flakes (for some drama at the dinner table) - use your imagination. Mainly, you don't want anything that's going to leak a lot of water. Okay, now imagine that at least a half an hour has elapsed, and you are ready to actually form your tortellini. Unwrap the ball of dough, and cut it into quarters. Keep one of them out and wrap up the other three. 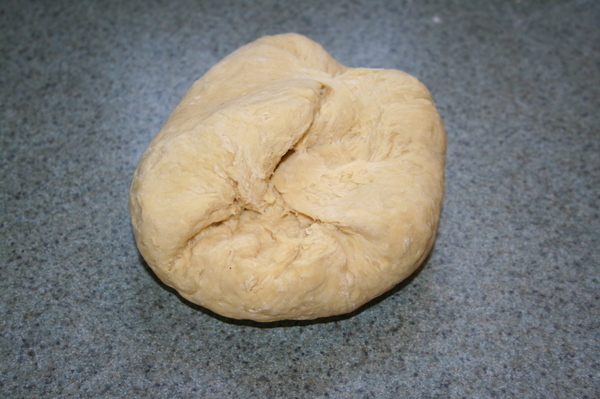 This is a very dry dough - it won't stick to your work surface, for instance, so you do not need to dust that with flour. It's great to work with, but if you don't keep it wrapped up, it will dry out quickly. Just so you know. Anyway, get your rolling pin out and flatten the piece of dough a bit. Now start rolling. This isn't a quick and easy process, like rolling out cookie dough. Blame the gluten strands. And just keep rolling. You want to roll from the center out - away from you and toward you. Flip the dough over, and do it again. Middle, away. Middle, toward. If your work surface is large enough, you can roll this out into a circle, or something approximating a circle. I was rolling mine out on the counter between the sink and my mixer, so I just rolled it into a long, flat, roughly oval shape. You need to start the dough off as a long, slender piece and put the pasta machine on the widest setting, pass the dough through a couple of times, and then move the setting to the next one, rolling the dough through a couple times and narrowing the space between the rollers, over and over, until you get a long, very thin, sheet of dough. You may have to cut the sheets in half to work with them on the thinner settings - unless you have really long arms and a lot of space to work in. Or you can just keep rolling and rolling and rolling. That's what I did. I can feel it in my shoulders and neck and upper abs today. In part because I had to stand up on my toes to get the right height and angle to really apply pressure and stretch that dough out. But it was fun, and it felt like I was accomplishing something. Next time, I'll use my regular work table, just so I have a bit more room. I think I will be able to get the dough thinner. Ideally, you want the dough thin enough to almost see through. You should be able to hold, say, a playing card under the dough and know if it's a red or a black suit. Mine was thin enough to detect color, but it could - and probably should - have been even thinner. 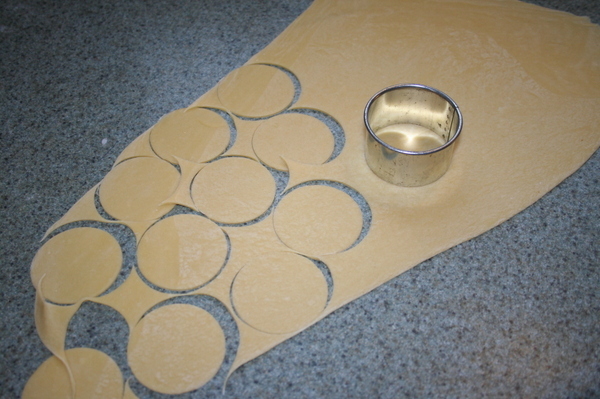 Okay, next you need to cut out little circles to make your tortellini. The cutter I used was about 1 7/8 inches in diameter. Somewhere between 1 3/4 - 2 inches is good. Smaller is better, but if you're new at this, a bit larger is easier to work with. As you cut the circles out, stack them up and cover them with a drinking glass or bowl or something to prevent them from drying out. You can also sprinkle a TINY bit of flour on each side of the dough before you start cutting, and smooth it over the dough surface with your hand, just to prevent the circles from sticking together. Okay, now you can either go through each quarter piece of dough and cut ALL the circles out first, or you can do it in batches, which is what I chose to do. Either way is fine. So you take some circles - a few at a time, because the dough will dry out - and set them down on your work surface, and place a VERY SMALL bit of your filling in the center. And I mean VERY SMALL. 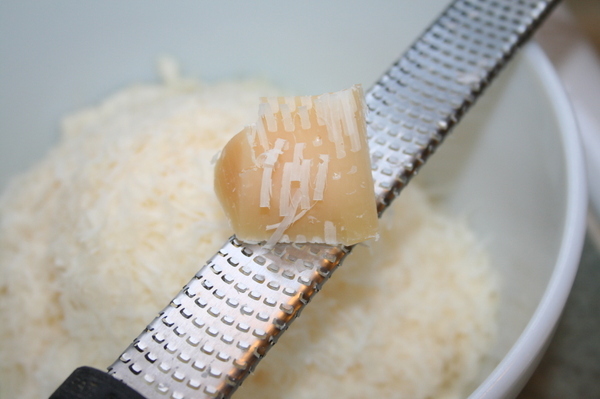 In fact, what you think is very small probably won't be small enough, and when you seal the pasta closed, some of that filling will seep out the edges. Which is what I kept doing. But eventually you will figure out just the right amount, and all will be well. And as long as you seal the edges well, the tortellini won't burst open while cooking. See those? That's too much filling. 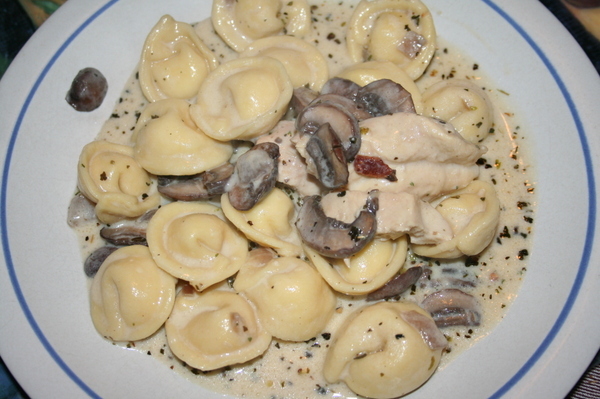 If you look at the completed tortellini in the upper right corner, you can see bits of ricotta along the edges and on the surface. 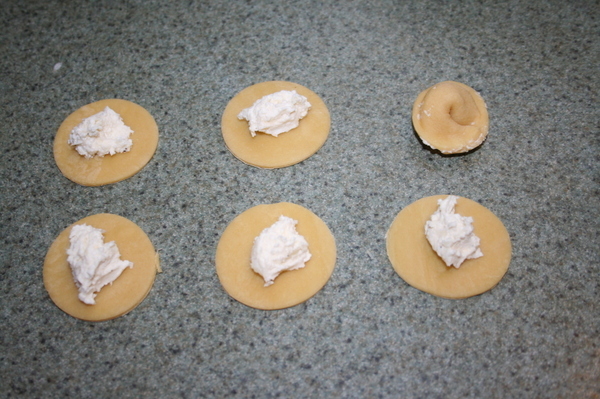 To form the tortellini, after you put a teeny tiny bit of filling in the center, dip the tip of your finger in some water and very lightly moisten the dough all around the edge of the circle. 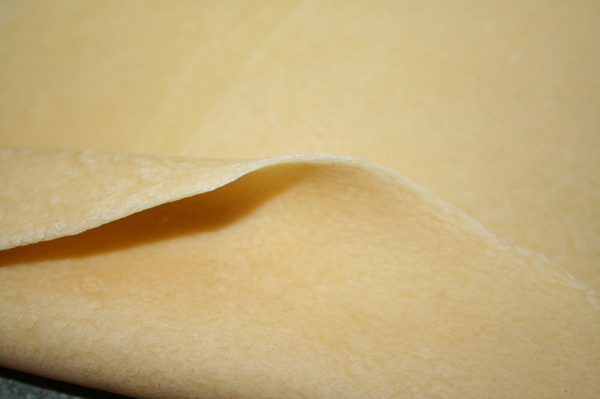 Then you want to fold the circle in half and press along the edges to seal the filling inside. Then, holding the half moon of dough with the rounded side toward you, bring the points together and overlap them, pressing together to seal them. 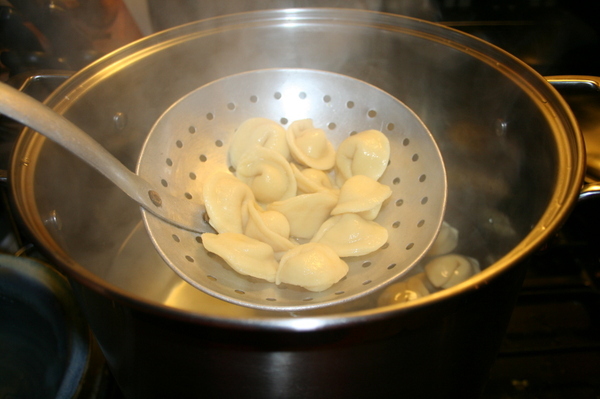 Place the finished tortellini on a dry dish towel or other clean cloth, and leave them at room temp. They'll start to dry out, but that's just fine at this point. 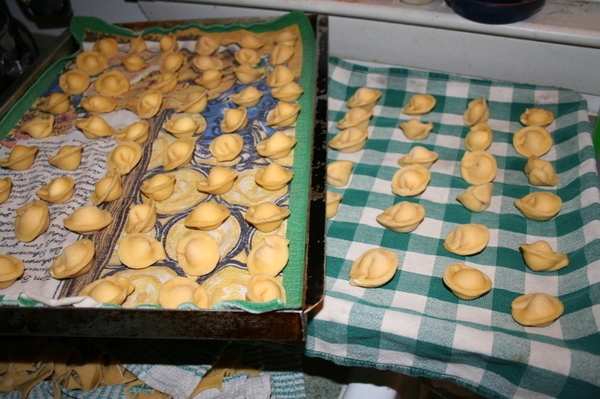 Anyway - once you've got all your tortellini made, give yourself a pat on the back - the time-consuming part is over and soon you can eat. I sliced about 8-10 ounces of fresh mushrooms - I used baby bella, but you can use whatever you want. I sauteed them in melted butter (I like the flavor of butter with the mushrooms) and a small onion, diced. I also poured a bit of cognac on the mixture after the mushrooms had started to brown. I would have used sherry, but we were out of it. Leave the pan on a low flame so most of the moisture cooks out and the flavors concentrate. Salt and pepper to taste. In another pan I cooked half a package of sliced bacon until it was crisp, and after the bacon slices had cooled, I broke them up and put them in a bowl for later. Then I took a little of the bacon fat and added it to the mushroom mixture. I had found some chicken in the freezer the day before and had left it in the fridge to thaw. There were two boneless, skinless breasts in the package, so I sliced them up and set them in with the mushrooms, turned the heat up a bit, put a lid on the pan, and cooked the chicken that way. I flipped the chicken pieces over after a couple of minutes, just to make sure it cooked all the way through, and when the chicken was cooked, I sliced that into smaller, bite-sized pieces and mixed them back in with the mushrooms. Heat off, lid on. When the water was nearly at the boil (it's a really really big thick pot and it takes a long time to heat the water) I mixed together milk and butter according to the package directions of the Wildtree Alfredo Extraordinaire blend we had, whisked in the dry blend of herbs and powdered cheese and all the other good stuff they have in there, and set it aside. Actually, my husband kept whisking it a bit longer while I cooked the pasta. 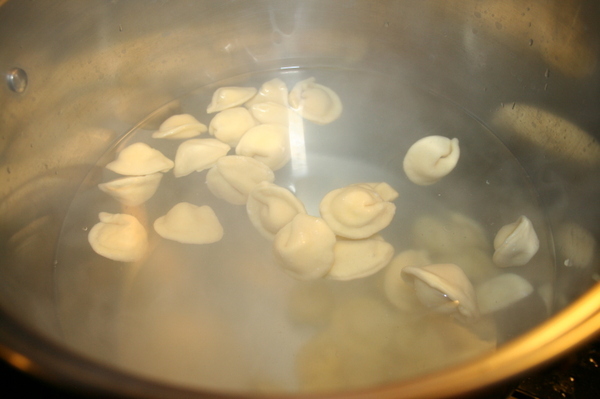 When the water came to a full boil, I added some salt to it - probably a couple tablespoons, maybe less - and gently added about half the tortellini. They sank to the bottom, and as they cooked through, they gently floated to the top. and put them in a bowl until all of the pasta was cooked. I warmed the mushroom chicken mixture back up a bit, added the alfredo sauce mixture to that, and then added about a third of the broken bits of bacon to that. Let them simmer briefly, then I poured the whole mixture over the pasta. I'm unhappy to report that we ate the leftovers for lunch today and tragically there is no tortellini left in the house. On a constructively critical note, the dough really should have been thinner. These tasted yummy, but the balance of pasta to filling was off. But since I love starch in all its many forms, I didn't mind. And on a FYI note, I don't get paid to mention any of these products - I just figure, if I like them, I'll let you know about them. The Wildtree Herb company is based in RI and I've used their products before. Their scampi blend is really good, too. But definitely give it a shot. There's something very satisfying about making foods from scratch. And also from flour and eggs.